A classic spot silk dressing gown that is perfect for home or travel. 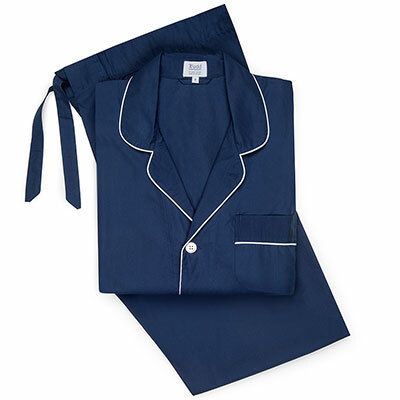 This elegant royal blue silk dressing gown with small white spots would cheer up the start and end of every day. It has a shawl collar, three traditional patch pockets and is piped in contrasting white coloured silk. The dressing gown is cut from 36oz foulard printed silk which makes it the perfect item to travel with as it falls back into shape almost immediately it is unpacked. The cut is generous so you will always feel comfortable and never restricted. The gown has an especially generous wrap, ensuring it doesn’t flap open unexpectedly (or embarrassingly! ).